One of the most eagerly-awaited unveilings of a new race car in a long time was the debut of Doug Ripley’s CC Racing Top Methanol Funny Car in March 2004. 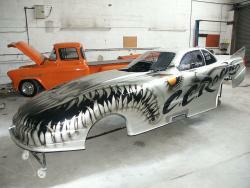 The car arrived at Doug’s Northfleet workshop in October 2003 as a Fuel Funny Car and the CC Racing team spent the best part of six months changing the car beyond all recognition. Doug and Crew Chief Cliff Gould kept a long-standing promise when they kindly invited Eurodragster to take the first look at the CC Racing TMFC in March 2004. The decision to acquire another car was taken in 2003 as Doug had had vision problems with his previous TMFC, a Ford Probe whose tiny front windscreen was blocked still further by the installation of a Whipple supercharger, the first to be used in UK TMFC. The original plan just to change the body quickly changed to the acquisition of a rolling chassis with Avenger body, which arrived last autumn. After we had taken our fill of photographs, we sat down with Cliff Gould and team member Andy Oliver who told us about the work undertaken on the car by the CC Racing team. “…although needless to say it’s Cliff who has to get it down the track!”, interjected Andy. Doug Ripley took a few minutes out from what was obviously a very busy day to tell us about CC Racing. “I’ve been in the business for fifteen years”, he said. 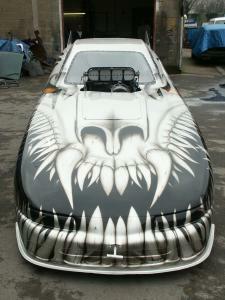 “We fabricate and maintain race cars, street cars, hot rods, and anything American. Right now for example I’ve got a couple of tube-chassis cars in the Shop which are meant to compete in Custom Car Street Eliminator, and Laurie Craig has a Super Pro ET dragster coming in the Shop soon". Doug's roots were always in altereds, but that changed when he bought a Keith Black engine which turned out to be too much for the chassis he then had. Since then, he said, "We have found out why there are so few Top Methanol cars in this country!". Doug said that he is grateful to all of the team for their financial input, and to David Taylor and John Price at Flint Insurance - the team's only sponsor. It came as no surprise to us that in a sport where everyone helps one another Doug has received a lot of assistance. "Winston Sewell has done a lot of work on the car", he said. "Dave Milam has been very helpful and he will be sorely missed this year. Ralph Craig sponsors our methanol, and I can't say enough about my wife Jane and Cliff. I really don't know how Jane hasn't thrown me out!". You will be able to see the new CC Racing Top Methanol FC at all MSA British Drag Racing Championship rounds at Santa Pod and Shakespeare County Raceways, and at the FIA Main Event and FIA European Finals at Santa Pod Raceway. 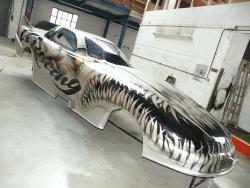 If you would like CC Racing to build or work on your race car then you can contact them on 01322 380980. 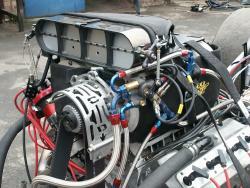 We took several pictures when we visited the CC Racing workshop, which you can view by clicking here. We would like to thank Doug Ripley and Cliff Gould for the invitation to view the TMFC and for offering to give Eurodragster the first look at the car. Thanks also to Doug, Cliff, Andy Oliver and the whole CC Racing team for their time and hospitality when we visited the workshop.